Stretford M32 Gardening and Tree Surgery | YGM Cleaning Company Ltd.
You just began this year’s early spring cleaning, and you feel completely exhausted already? Well, we hate to remind you, but spring cleaning could include not only deep cleaning your house, but cleaning up your outside place as well. Do not worry! 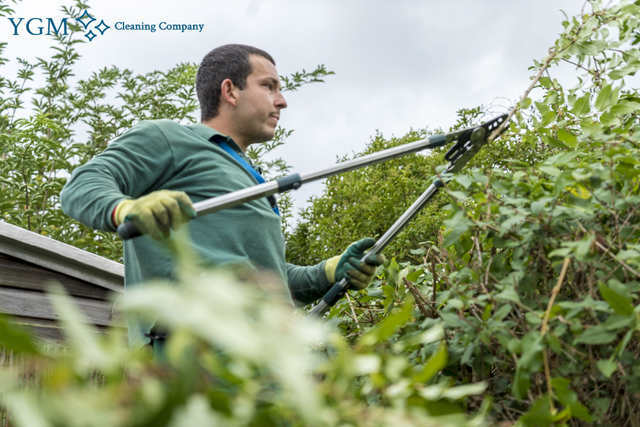 The professional gardeners in Stretford from YGM Cleaning Company Ltd. can instantly, efficiently and appropriately take care of the garden clearance, garden waste removal, as well as offer jet washing for patios or driveway, at a surprisingly reasonable price. The professional gardeners can take care of your overgrown lawn, flowers, plants, your trees, and your entire patio spot arrangement and maintenance. No matter if you are a tenant, a landlord or office or home holder, this company will assist you make your backyard place as prettier as ever and will transform it in your favorite spot for recreation with loved ones and close friends. So, when looking for the leading gardening service in Stretford and the area, this is the company to turn to. Call right now, to find out how much it will cost you to make your outdoor space as clean, beautiful and well-arranged as you possibly can! YGM Cleaning Company Ltd. was established in Stretford in 2005 and has more than 10 years of experience in keeping the outdoor and gardens areas of the businesses and residents in Stretford. The top quality services supplied by skilled professionals are at extremely affordable prices, and the fantastic outcomes are guaranteed. The company offers top quality lawn mowing and lawn care to all customers in the region. The experienced gardeners will certainly examine your lawn and will give you their professional opinion of exactly what should be carried out, as a way to enhance its appearance and health. The mowing and maintenance is performed with the latest trimmers, lawn aerators, mowers, weed killing gardening tools, rakes and many others. Aside from shaping and mowing your lawn properly, the professional gardeners can deal with any yellow or otherwise damaged patches. The professional lawn care services offered include: lawn edging, grass trimming, mowing, lawn aeration, autumn and spring lawn care, feeding and scarification for healthier plants. The company provides lots of garden maintenance services of the top quality aside from lawn mowing and care. A lot of them involve: garden clearance, weeding, care for neglected gardens, ivy removal and other professional gardening services, that can help to make your garden far too ideal, and maintain it simply perfect for longer. The company delivers garden maintenance, autumn and spring lawn repair, lawn care, lawn aeration, lawn scarification, overgrown lawn feeding, and ivy removal, landscaping, maintenance, tree surgery for your trees, garden clearance, jet washing and weeding, among all other top quality gardening services. The additional gardening services in in Stretford M32 that are offered include: tree surgery performed by educated and high skilled trees surgeons, jet washing of driveways, patios and garden furniture as well as professional garden design, or landscaping services. All gardening services are with a guaranteed quality and are completely insured. Again, in case you are searching for probably the most trustworthy professional gardening services at reasonable prices in Stretford, you need to book your desired service right now! You may ask for an onsite check out if you are not specifically sure what type of gardening expert services you need, or how many hours of the gardening services in Stretford M32 you need to book. Use the online form here, or call the 24/7 telephone number 0161 823 0323 to get in touch with the customer care service for professional gardeners these days! Order a mixture of gardening or outside maintenance services and you will get a mighty discount. If you turn into a regular client, you will be given preferential cleaning! Contact now, book now and prepare to get the patio or garden of your dreams! Other services we offer in Stretford M32 Oven Cleaning Stretford, Carpet Cleaning Stretford, Upholstery Cleaning Stretford.